This will soon be the food and beverage tent at Super Bowl LIVE. 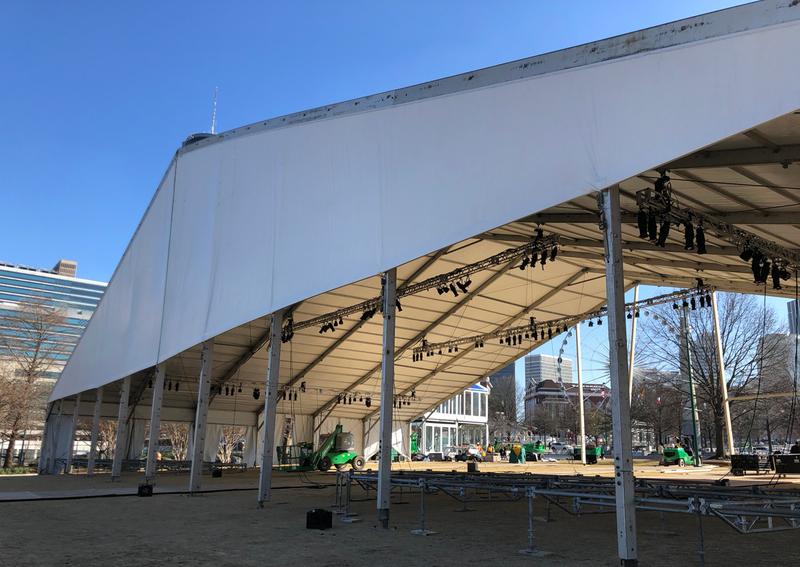 Centennial Olympic Park has been closed since last week as crews prepare its transformation into Super Bowl LIVE, a giant free fan plaza that will officially open on January 26. The multi-day event will host free concerts curated by Jermaine Dupri, as well as activities (think of things like a nacho-making competition from sponsor Tostitos, or appearances from NFL players) throughout the week of the game. 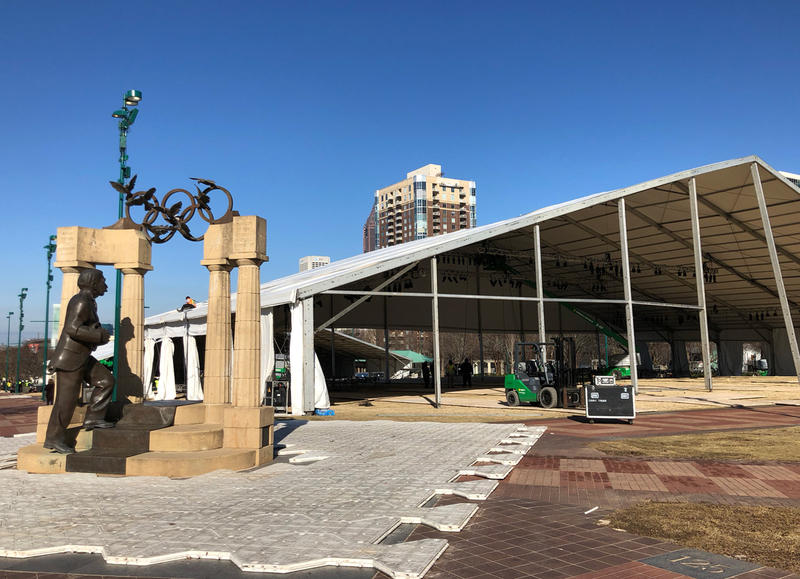 During a media tour on Tuesday afternoon, representatives from the Atlanta Super Bowl Host Committee and Kreate, Inc.—the events management firm that also produced last year’s Super Bowl LIVE festivities in Minneapolis—walked a handful of reporters through the park to see the construction so far. 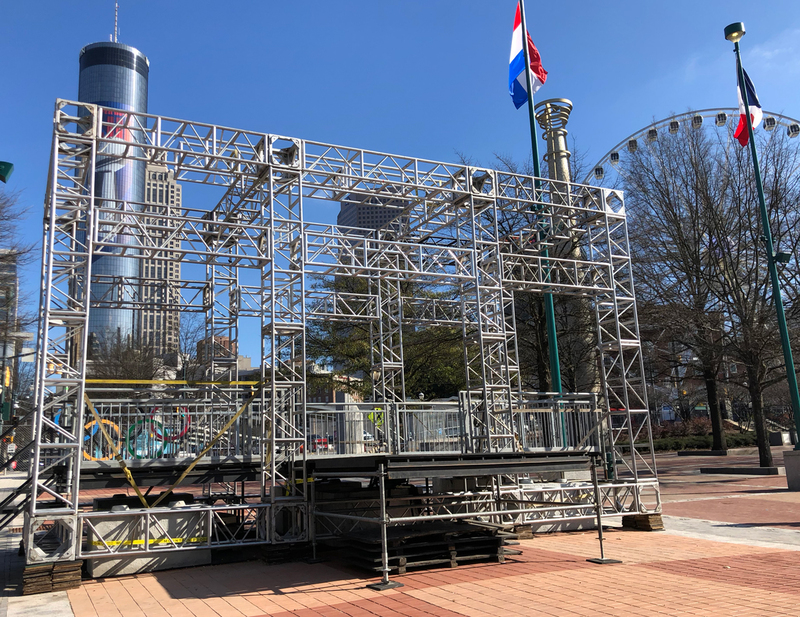 A large wire frame set up near a park entrance on Centennial Olympic Drive will soon become a boombox-shaped stage, where a DJ will be posted each night of the event. The main concert stage at the far north end of the park is enormous, as is the food and beverage tent located just south of it. Numerous activity areas from sponsors such as Ford and Verizon will also be scattered throughout, and the NFL Network and ESPN will hold live broadcasts from the park. Videos will be projected onto this Lombardi Trophy during Super Bowl LIVE. All three windows of Mercedes-Benz Stadium will have graphics. 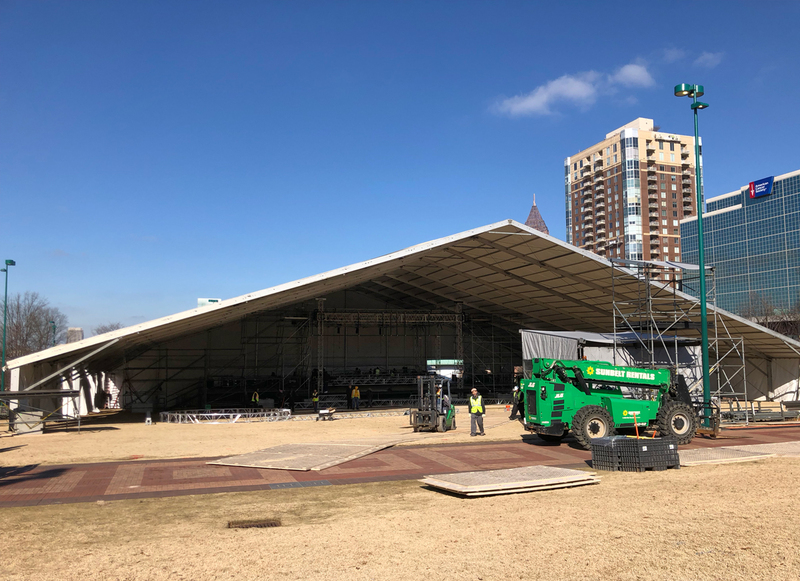 The park has a clear view of Westin Peachtree Plaza hotel, where a 77-foot by 301-foot tall banner of the Lombardi Trophy that faces the festivities has already gone up. 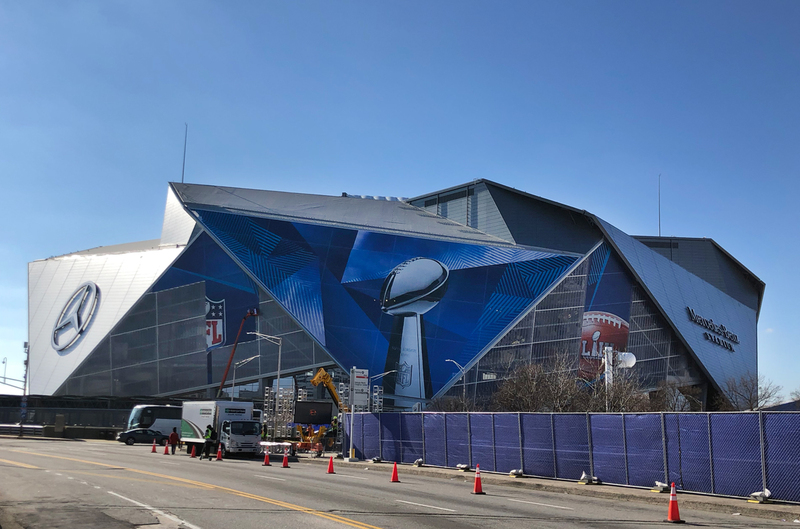 R.J. Orr, executive vice president at bluemedia, which created the large-scale graphics, explained that during Super Bowl LIVE, video projections will be mapped onto the trophy, making it more interactive. 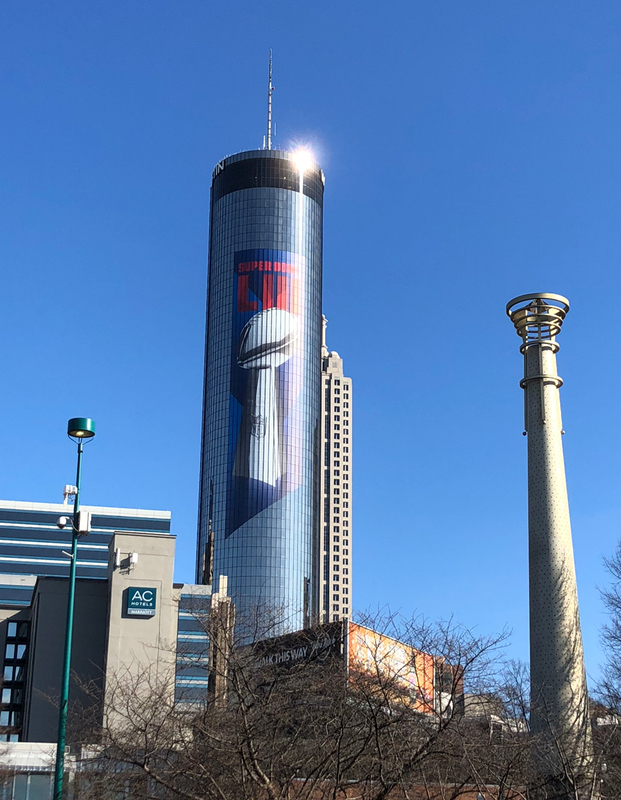 Videos will also be projected onto the Lombardi trophy that has taken over the middle window of Mercedes-Benz Stadium. 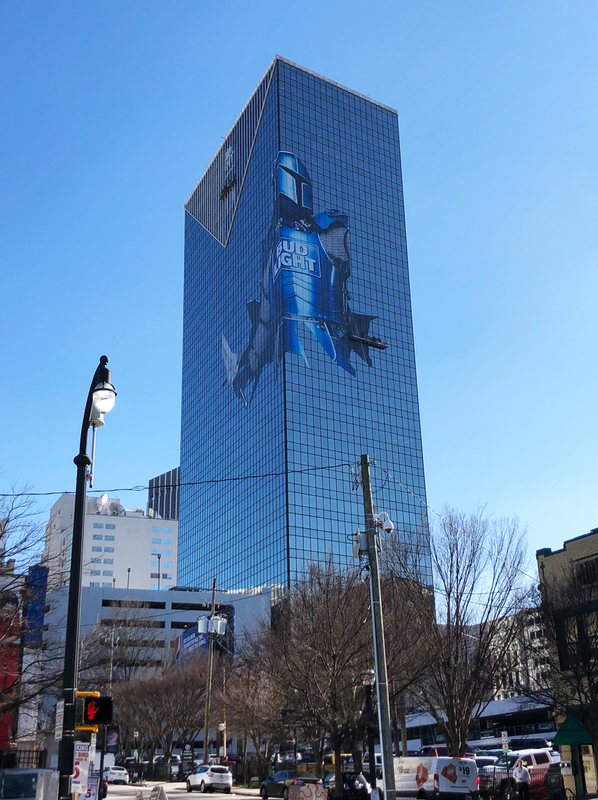 Other graphics that are going up: Pepsi and Verizon ads on the side of the American Cancer Society building, and the “Bud Knight” on the 101 Marietta Street building, which is about half-finished. In addition to the streetcar wrapped with Super Bowl LIII graphics that has been running downtown for about a week, another streetcar will be wrapped to represent the two teams that make it to the Super Bowl. 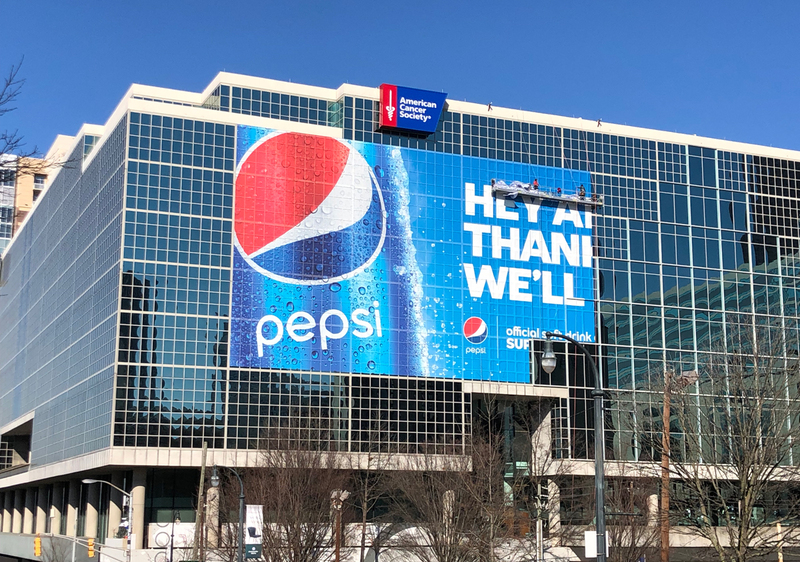 Those teams will also be represented in graphics that wrap around the bridge that connects the Omni Hotel and CNN Center, and on the Marriott Marqius bridge.